Which mod is it that I'm doing with this bit of kit? You guys that have been around have done all this already but, it's new to me and exciting as hell too. I still need to buy the springs but, I need the money to pay for the springs and that hasn't done it's miraculous appearance yet. Money sure is a PITA when you aren't made of it. My rig has basically no flex to speak of with her too short Pro-Comp 5" lift springs. That is all about to change, we're going with the Chevy 63"s and rears up front as soon as the funds allow. I need the adaption parts and springs for the front also and I won't put used anything on my rig if I don't have to and used springs ain't happening. I just have to wait a few weeks, no big deal. The brand new rear springs will be purchased next week as soon as my pay check gets into my greedy mitts. It was a while longer than a few weeks but, I finally ordered me some new springs and they'll be here next week so I'll be blowing apart the rig one more time again. bleh. I remember looking at springs when I wanted to RUF/63 my truck. was like 80 bucks a spring for the chebbies and something else crazy for the rears. Went to Pull A Part paid 30 for both chevy springs with shackles. Everyone’s experience can be different. I’ve owned and driven more USED vehicles than NEW ones. Since I did most of the maintenance, I purchased new and remanufactured parts. Over the years I also spent lots of time in a boneyard and U-pick-its, or making swap deals with friends. Thinking back, and in my recent experiences with used parts, the new and reman parts usually failed sooner than the used parts. Arguably, the used parts are often factory original, and as we know they are typically better quality at time of manufacturing than many of the aftermarket replacements. The difference in cost can be a huge advantage for the used part purchases, especially for a limited budget. I buy used stuff but, if I can handle buying new or remanufactured stuff, I do that first and springs just seem like a smarter idea to buy new and our junk yards here in the SFV seem to think their used parts are more valuable than new, dude wanted a C note for each side so I laughed in his face and walked out convinced new was my only path. Understandable. I just got off the phone with some clown in Pensacola parting out a bunch of dodges. Asked if he had a dana 80 dually rear with 3.54 gear. He replied "yeah I got 2 bring me a thousand dollars and a core". I politely replied to him that I thought he was too high on that price and if he wanted a srw d80 on trade I would give him a few dollars and he told me no "why would anyone wants a srw 80?" Hes obviously hit his head. They are a lot harder to find than a dually 80. I hung up laughing. On man's trash is another man's treasure. Geezuz, it took me forever to get around to it but, the springs are finally installed. Barnes 4wd sold me the kit to mount the 63s and it had shackles that were basically stock, they were too short by 2". They made the truck take a Pre-Runner stance and that was unacceptable because of the wrong pinion angle and the vibrations there from. 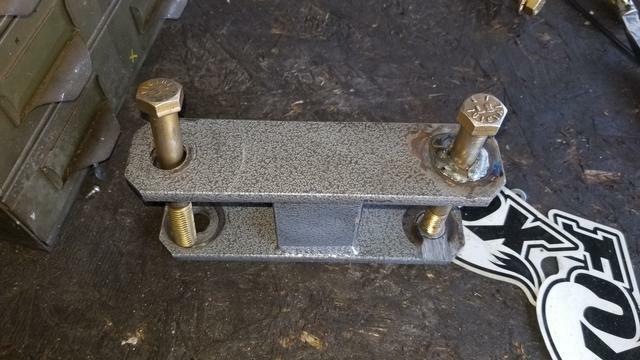 So I took my old Warrior shackles to a friend that can weld and has him sleeve them to fit the 9/16 Chevy spring pivot bolts, come out good. 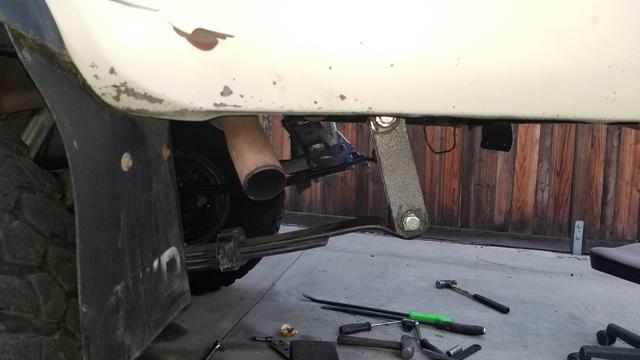 The Chevy springs are a few mm wider than Toyota springs so I had to modify them to fit my shackles and everything is back together the way it should be. The shackles are finally sitting at a proper proper angle. The Pro-Comp springs I just removed were too short lengthwise and my shackles hung 100% vertically. I haven't been out yet, had to work today but, the work is all finally done and I can go wheeling. Springs are settling and even with my original Warrior shackles, she has dropped a bit in the rear and I'm not liking the look. I should have bought 3" lift springs instead of standard springs, I'm thinking this would have been closer to what I want. 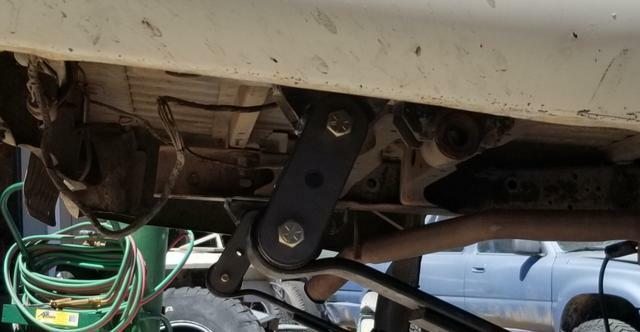 I bought a set of 6" Trail Gear shackles and applied them yesterday, the rig is level again and that pinion angle is good again also. Next weekend I am following a guy who likes to make us suffer body damage going through dry gullies where I get to drive sideways and my rig is finally suspended in the rear end the way I want her to be so I can follow him. I only need to do the same up front now. As soon as I can afford the springs I want, my front end will be moved forward 2" and then we will have "some" real flex out of my low budget Hilux. I have to say that it’s painful for me to see an old Toyota truck get thrashed and bashed. These early Toys are fast becoming a valued classic in the realm of collectables and preservationists. I believe these vehicles (early pickups and 4Runners) will go down in the history books of automotive discussions for many decades to come and may even be called a legendary Toyota manufactured vehicle. The 1984 to 1988 years models (my favorite body style) are getting very scarce. In an Autotrader.com search today, listed only 6 SIX - 4x4 pickups in any miles away from my home, for years 1984 thru 1988. There were virtually zero 4Runners that appeared in the list. If I were to get back into 4-wheeling, I would most likely be driving a trailered tube framed buggy. I may take my 1986 Xtra Cab off-road, 4-wheeling, camping, or exploring, but I will not thrash it on a trail run just for the sake terrorizing the terrain. Gnarls, when I bought my basically stock truck, she was already twisted from a wreck in the 80s where she was hit in the left quarter behind the wheel which makes the left side of the frame sit almost an inch higher until I took her wheeling the 1st time I ever went off road and I drove too fast broadside into a gulley amd then lifted the right side of the frame rail to almost even again. So my truck is bent and she has some cancer around the windshield. In other words, my rig was imperfect when I started with her and would have cost way more to have the frame straightened or replaced than it was worth financially. So I in good conscience beat her like I own her and wear her battle scars with pride because for the rest of my days, this will be my Yota and since my days are numbered due to my lungs and throat, I'm gonna wheel her like I stole her. 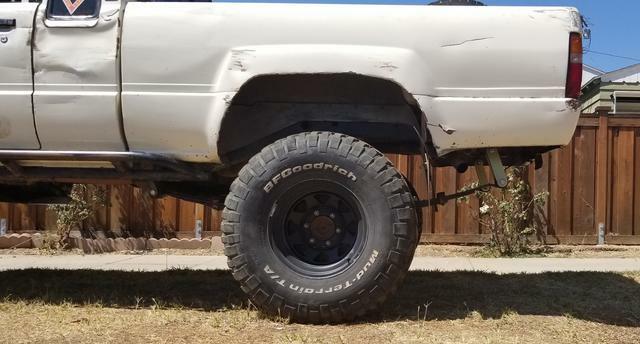 1987 Toyota $X$ Extra,Xtra,Xtra, Clean. Page created in 0.337 seconds with 37 queries.